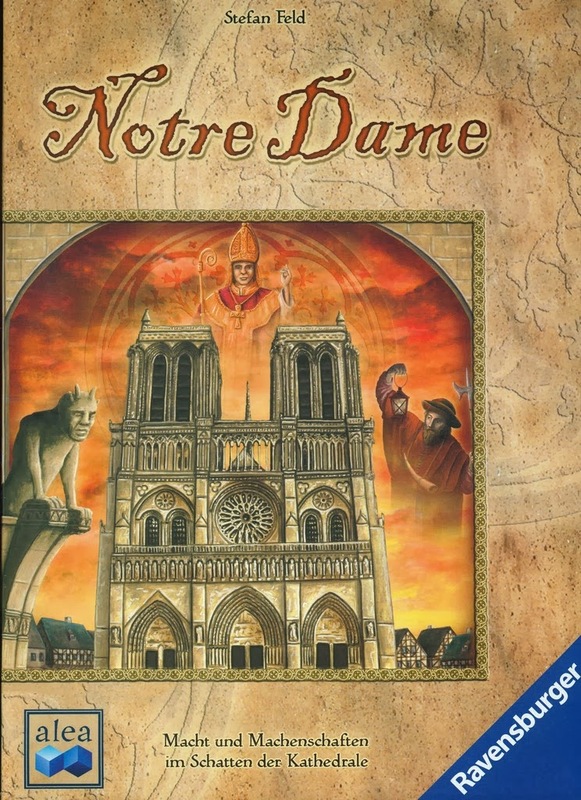 In short, Notre Dame is a game about points generating through a bunch of mechanisms such as action selection ( through card drafting ), engine building, and tight resource management. Players have a standard deck of 9 action cards. They will draw 3 cards, pick one, and draft the rest to/from their neighbors. These action cards determine what you can do during that round. This allows players to in a way, influence what their neighbors can do and to deny certain actions to them by keeping the relevant cards away from them. The interesting part of Notre Dame is how the cards allow you to build the multiple engines in the game. Of the 9 cards, 7 help to build a personal engine, 1 is a wild, and 1 is a direct fight for points via control of Notre Dame. My favorite part of the game is the decision on which engine to build. Will you go for a constant supply of action cubes to activate other actions, or will you go for coins to influence the characters in Notre Dame, or simply outright invest in a heavy points strategy hoping that it will last long enough till the end of the game? The engines can be swapped mid game but investing in a wide range will likely see you fall far short of the podium finish. Neither of the engines are considered extremely important and a must have. If you ever run out of cubes because you had no action cube engine, you could simply move them from one area to another. The decision on how you want to power your strategy lies solely in your hands and finding a good mix that caters to your needs is the interesting part of the game. After the action phase, players may opt to pay a coin to obtain the benefits of 3 unique characters on the board. These characters change throughout the game and come out in some sort of order so to speak. So you will have an idea how soon they are to appear and what you can earn from them. These benefits range from obtaining more resources, scoring points from your engines, eliminating the plague for a turn, or simply allowing you to rearrange your engine. All the benefits are extremely useful but you will only get to hire 1 each round. So choose wisely ! Once the hiring is done, a plague occurs. The value of the plague is known right at the start of the round, so players will know if they will be hit or whether it is avoidable on the turn itself through clever play. The penalty for the plague is not extremely harsh ( loss of 2 points and 1 cube from your most powerful engine ) but extremely irritating. This carries on for 3 rounds before players score for controlling Notre Dame ( or not ) and after 9 rounds ( with Notre Dame being scored on the 3rd, 6th and 9th rounds ) the player with the most points is the winner. Controlling Notre Dame simply involves playing the card, paying some money, place your action cube on the board and hope you have more than most in that area, thus scoring you more points than the others who are present or not. Playing the Park card / and a Pile of Points !! 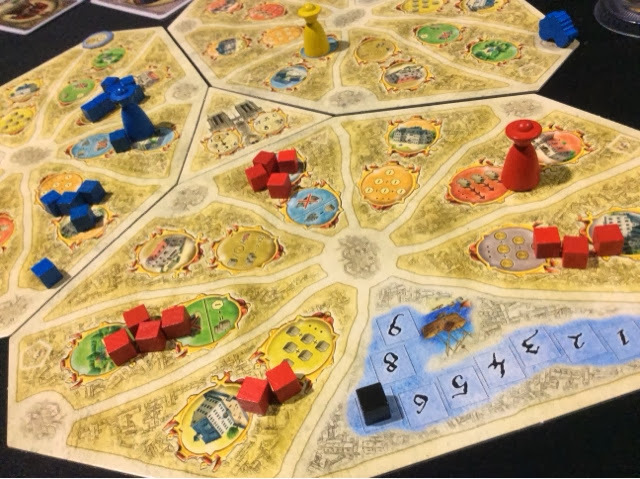 For my 3 player game of Notre Dame, I decided to see if it was at all possible to completely avoid the plague throughout the entirety of the game ( and still win ). In my last 2 plays, the plague was a huge problem for everyone, and no one left unscathed. We took it like a man and just decided to rush for more points than we can lose. 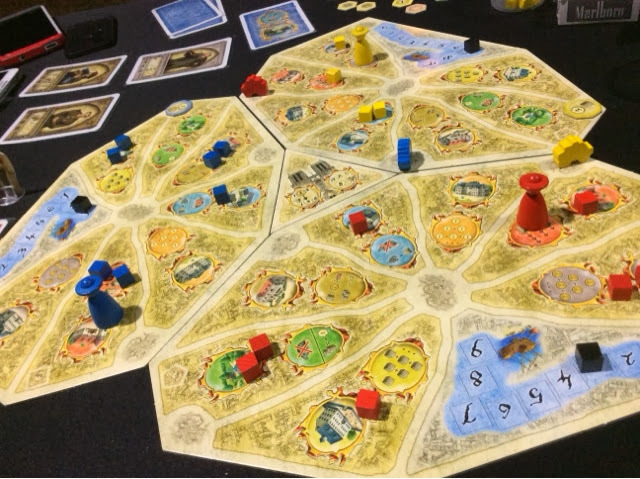 I invested heavily on the hospital and the park, thus keeping the plague low for me each round and allowing me to score additional points each time I scored any points. I started out really slowly. I only managed to collect one message and realized that my hospital engine was too advance for an early game strategy. The player in the lead took all the points from Notre Dame with just 1 of his cubes. He also focused on donations to Notre Dame for even more points. I sat there wondering where all my points will be coming from. The other player was kinda lost and made do with a cube churning strategy for later game advancement. By rounds 4-6, I started to see my investment pay off; especially thanks to the character who gave me 1 point per space in front of my plague marker. I put some emphasis on coins to store for Notre Dame and to hire the later characters. Our Notre Dame happy guy was swarming with rats, but also with points. He didn't generate cubes nor try to prevent the plague, he simply moved his existing cubes from one area to another and got more from some of the messages. Whereas our cube heavy friend was balancing plague and points generation through the points engine. Somewhere along the way I just exploded with points. My additional points park was a gold mine to me and each character just kept giving and giving. By round 7 I knew I had it in the bag. Mr Notre Dame had a lot of points but really slowed down near the end of the game. He had neither coins nor cubes nor the mercy from the plague. Mr I Love Cubes had done up his points engine well, but a little too slow. I finished with 65 points, Mr Notre Dame had 51 points, and Mr I Love Cubes had 37. All in all, Notre Dame is wonderful not just because of its engaging gameplay. I also love how quick it plays and how easy it is to teach to new players. The decisions are tough but never too tough that you have to take eons to figure out what you want to do. And the choices between so many engines really allow you to customize the game to your liking. You can play it different each time and try to find a different way to outsmart the players across the table from you. I bought it simply for the fact that it had "Stefan Feld" written on the box, and that I found a very cheaply priced used copy. I didn't know what to expect from it then, but now I'm most delighted that it found a way into my collection. 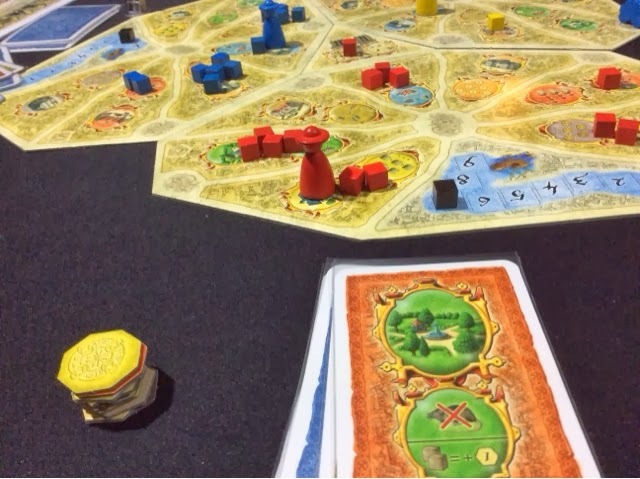 It might actually fall into my top 5 Felds ever, but I won't know exactly that till I sit down one day to dissect all of the Feld games I have played. But for now, its a sure winner for me and one that I would gladly sit down and play anytime.